The attempts by venture capital-backed online insurance agency start-ups like PolicyGenius and Coverhound to capture market share reminds me of when McDonald’s, Burger King and other fast food companies entered the restaurant market several decades ago. PolicyGenius and Coverhound are building platforms for the insurance consumer who doesn’t want or even appreciate the need to talk to an insurance agent. Their target audience, in particular, is millennials who already handle their other financial transactions, such as banking and investing, online. Insurance companies have long been accommodating this preference by offering online quote engines, either as standalone landing pages or as a feature of an insurance agent’s website. But start-ups like PolicyGenius and Coverhound are not just pimped-out quote engines. These companies use quotes as part of a comprehensive user experience that is highly customer focused. For one thing, both companies provide content-rich websites. Coverhound has blogs, articles, scores of infographics and a Learning Center. When PolicyGenius explains rental insurance, long-term disability, pet insurance and other products, it drills down and explains product benefits in terms of individual profiles. For example, they explain how renters insurance “makes sense” for college students, people in the military, roommate situations, people with children and pet owners. The food was maybe not that much different, or not even as good. But the overall experience was such an impressive contrast. It felt good to go there. “Food, folks and fun,” was one of McDonald’s slogans in the 90’s. Where else could you get a Happy Meal? That’s a dramatic change. People don’t like fast food as much anymore. Restaurant owners began to wake up. They started to understand that they needed to focus on the customer’s experience. The food got better. The overall experience got a lot better. Restaurants with distinctive menus, fresh ingredients, celebrity chefs, great servers and more started appearing. 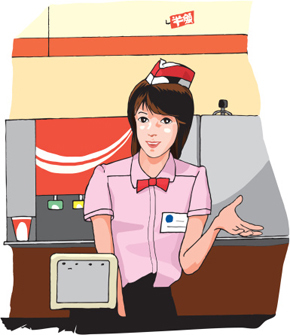 Fast food restaurants began losing market share as consumer tastes became more discriminating and demanding. Burgers and fries in a clean, well-lighted place with plastic furniture got to be kind of a let-down after a while. The chef at John’s makes a great steak and you know the servers. And what about their melted chocolate pudding cake? They have trivia night and sometimes you watch a ball game in the bar. People you know go there, too. Suddenly food and fun is not just at McDonald’s. What happened is that restaurants started having personalities, and they capitalized on their strongest assets: their ties to the community, distinctive selections and personalized service. Sound familiar? What are the independent agent’s strongest assets? Ties to the community, customized products for those who need them and personalized service. There’s probably always going to be a segment of the population that doesn’t ever want to talk to an insurance agent. That doesn’t mean people don’t appreciate the benefits of having an insurance advisor they trust and respect. Independent agents are not, like taxes, a necessary evil. They perform a valuable service. The challenge for the independent agent is to help the consumer understand this. Working to improve the customer experience would go a long way toward addressing the challenge. Explain your insurance products in language customers understand. Simplify the application and underwriting process as much as possible. Provide helpful educational content on your website and in your other marketing content. Independent agents can learn from the competition. The restaurant industry did. If you’re an insurance agent, you probably don’t think of yourself as a writer. But I’m almost sure you’d be wrong to make that assumption. When I was in college I thought I might like a job as a writer. After I graduated I got a job as an insurance underwriter, which is a kind of writer, loosely speaking, but not what I had in mind. The noun “underwriter” comes from the act of writing your name under a document as a guarantor. The quality of your prose is not a factor. When I became an insurance agent, I started to see things differently. I began to appreciate how much writing and insurance had in common. Writing an insurance policy, having the pen, using XYZ Insurance Company paper — these phrases use writing only as a metaphor. But in the insurance business, as in any business really, you need to express yourself clearly and concisely in words and speech. As an insurance agent, I had to develop practical writing skills, something college had not fully prepared me for. Writing essays about disease imagery in Hamlet had stretched me only so far. For example, I had to simplify the language of insurance contracts so I could write to my clients about their coverage. For the average person, reading and understanding an insurance policy is as easy as licking your elbow. The Flesch-Kincaid readability score for a standard insurance policy is 10; compare that with 82 for consumer ads, 52 for Time magazine and even 43 for Harvard Business Review. Think if the insurance industry hadn’t started “simplifying” them thirty years ago. I wrote flyers for special programs our agency had created. I wrote policyholder summaries for all my accounts. To build credibility and reach out to prospective clients, I wrote a series of articles for Shopping Center News about risk management. I wrote news releases for the agency and our monthly client newsletter. I regularly submitted articles and letters to the editor to regional and national insurance trade magazines. Just like bloggers today, I was writing to build my reputation and credibility with the long term goal of getting more insurance clients. Maybe you were as surprised as I was to learn that being an insurance agent involves so much writing. But I’m not a writer, you say. I sell insurance. I leave all that to someone else. That’s only partly true. You write your own emails, don’t you? When you write an email or post something to Facebook or LinkedIn, you’re using the same skill set every writer uses. Even if you don’t do it often, you sometimes have to write a report or a presentation or a speech. If you think it’s hard to write short pieces about insurance, that’s only because you haven’t learned a system that makes it easy. It can be a lot easier than you think. Think about this: Every time you write an email to answer a client’s question or explain some policy detail, you have probably just written something that has the makings of an entire article you could post on your blog. Not everyone understands insurance. A lot of insurance people don’t even understand it. Insurance can be highly technical. In addition to explaining the policy, there may be risk management, regulatory, judicial and legislative considerations you need to bring to a client’s attention. Agents have an important responsibility to communicate clearly. Even if you’d like to, you can’t always explain everything in a conversation. It’s got to be written down. For one thing, you need to document your file in case there is ever any misunderstanding. You — and your errors and omissions carrier— may be grateful someday. As an insurance agent you probably do as much writing in a typical day as a professional journalist. You’re just not publishing what you write. Nor would you want to publish it. At least not the way you wrote it, verbatim. For one thing, you don’t want to compromise your client relationships. But what if you extracted some nuggets of information and advice from your emails? Could you shape those nuggets into something you can post it on your blog? “Write what you know,” said Mark Twain. You know insurance. You write about it every day. Why not use your skill to build your brand and boost your business? Need more convincing that you should start taking seriously your craft as an insurance writer? I’ll be posting more articles about this soon, including some how-to information that will make writing articles for your blog and social media accounts easier. Also, we will be publishing an e-book soon, a guide for insurance agents about how to write blogs and articles. In addition to your other social media posts — what’s going on at your firm, community events, and so on — you probably want to provide some insurance content from time to time. Sometimes you may want to post something you wrote on your blog, but often you’ll want relevant and objective insurance content from third party articles that reflect your insurance professionalism. You’ve probably already identified several good sources, but let me suggest a new one you may find useful. A few weeks ago, SmartsPro Marketing launched The Insurance 411, which is a website mainly for insurance buyers to educate themselves about insurance. However, the articles are perfect for agents who want to reach out and share well-written, informative and objective insurance content on their social media sites. Already the website has almost 100 professionally written articles on business and personal insurance, including commercial property and liability, benefits, workers’ compensation, homeowners, auto, personal life and health and more. And dozens more articles are posted each month. One of the advantages of using The Insurance 411 articles in your social media is that they are specifically designed for social media posting. Each article has a photo and a teaser, especially written to engage social media readers. Just paste the link to an appropriate article into your Facebook or Twitter posting, write a few words of introduction, and click “post.” Done! Here’s another example. You might decide to post something like this on LinkedIn. 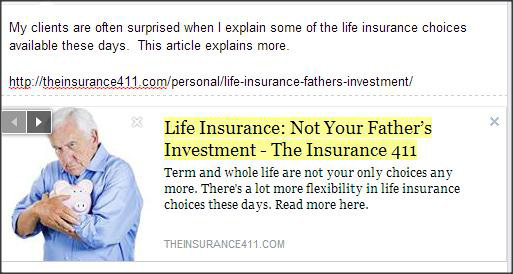 Check out http://theinsurance411.com, and if you find something useful to post, link to it with our compliments. And be sure to check back regularly for new content, and to check out our insurance agent directory, coming soon. 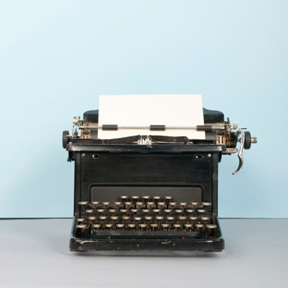 Is Your Agency’s Media Style Old School, Plugged-in or Big Tent? Which communication method best suits your insurance agency’s brand-building strategy? Just to be clear, I’m not talking about how you or the people in your agency relate to people socially, as when, psychologists talk about communication styles, using words such as aggressive, passive, assertive, competitive, affiliative and so on. I’m talking about which media you’re most comfortable using to build and reinforce your agency’s brand image. 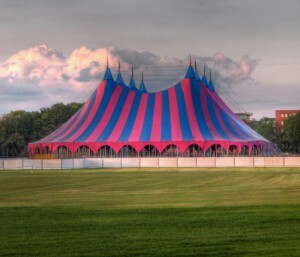 The Big Tent approach uses print and digital. . . What one medium doesn’t do for you, the other probably will. For many years, most agents relied principally on print, whether newsletters, newspaper advertising or trade magazines. A few agents would also venture into broadcast advertising using radio or TV spots. In the past 20 years, though, Internet communications in all their manifestations have come to dominate our commercial communications. Now agents have several new formats available and many older media have, thanks to the Internet, lost much of their impact. People don’t read newspapers as much as they used to. Niche trade magazines might still have some readers, but they’re not the most up-to-date source of information; emails and social media get the word out faster. With thousands of new broadcast channels available, radio and TV don’t dominate as well either, unless you have a certain demographic niche that narrowcasting can help you reach. One old media channel that hasn’t really lost its luster, surprisingly, is postal mail. Everyone still has a mailbox and everyone looks through their mail every day. Even Millennials get postal mail. Many agents realize this, which is why as a publisher of client newsletters in print and digital, we still have more customers who use print or print and digital formats than just digital. Some agents who take an old school approach to building and nurturing their brand by using only print newsletters might just be resisting new media because they’re deterred by the challenges. Using social media and blogging requires a lot of effort. You need content, you have to post regularly and you have to be active in the medium to able to engage your audience and know what they’re posting about. To take the easy approach to plugged-in communications, you could just send out an email newsletter. But to get the most out of your investment, you should pay attention to your analytics: Who reads your newsletters? Which articles do they read? Which addresses don’t work anymore and need to be updated? Aside from the additional time you might have to invest in using digital, there are pragmatic reasons to be old school. Email newsletters get opened about 25-35% of the time, whereas print newsletters at least get noticed by someone and so at a minimum they accomplish your branding mission. Print or Old School: It’s tried and true, dependable and you don’t need to invest a lot time engaging on social media or counting clicks. Digital or Plugged-in: To be effective, get engaged in the process. After your email newsletters go out, track who reads your newsletter and which articles. Update your contacts regularly. To make the most of your digital content,; use it on your social sites, your blog, in your drip campaigns. Big Tent: Take the belt and suspenders approach. What one medium doesn’t do for you, the other probably will. Whichever approach you choose, the goal is to communicate regularly with your clients and to give them quality, actionable information that helps them manage their insurance and risk. SmartsPro Marketing can help you whatever route you take by providing professionally written and designed newsletters in both print and digital formats that will position you as the go-to expert in your niche. Is there a Content Tipping Point for Converting Insurance Prospects to Customers? Here’s one thing I know: Hundreds of our customers have used our insurance client newsletters year after year after year — some of them for more than twenty years now — because their clients and prospects read the articles. It’s as simple as that. They read the articles, so they trust the agency that provides the articles, so they do business with the agency. How do I know this? I know that the agency owners and marketers who buy our services are smart, intelligent people and that they don’t spend their hard-earned money foolishly. But do I know this empirically? No, I don’t. I don’t even know if any of our customers have scientifically tested this assumption. If you ask them, they usually say they know newsletters work because they do. One of the great things about the Internet is that it gives us the ability to test the scientific validity of things we “know” in our gut. This leads to actual knowledge we can use to improve our marketing. There’s a social media marketing guy I follow, Marcus Sheridan, who writes a blog called The Sales Lion. Marcus, who also owns a pool-building business, wrote a blog about his epiphany several years back when he realized after reviewing leads obtained from his website that the difference between leads who bought a pool from him and those who didn’t was that the pool buyers were leads who had viewed more than 30 pages on his website. There is a tipping point for making a pool sale, he discovered, which is getting people to view at least 30 pages of his content. The challenge for Marcus was to get more visitors to read more content. So he started writing more and more content related to buying and building pools. I suspect there is a content tipping point for insurance marketers as well, whether that content is delivered to visitors via paper or email newsletters, social media or websites. I wonder what it is? I challenge any of you insurance marketers to discover that tipping point. Delve into your analytics and see if you can discover how many pages of content a visitor who has converted from prospect to customer has read. I know there is a tipping point for my business — providing marketing tools to insurance agents. I’m trying to nail it down. I’ll let you know when I do. Meanwhile, above all, keep providing fresh, new content. 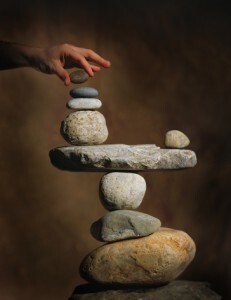 Even if you can’t always measure it, as Marcus Sheridan has discovered, there is a tipping point for every business. And the more content of value that you provide, the more likely your prospects will reach it — and become customers.